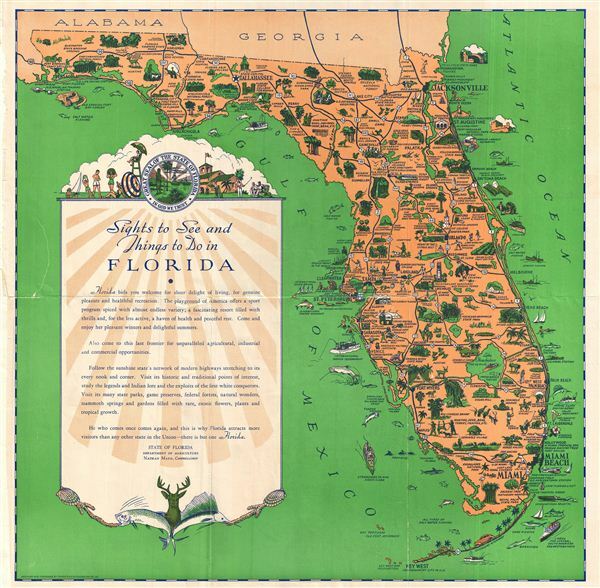 A fine decorative pictorial map, this charming tri-color tourist map of Florida is covered in fascinating details that make Florida look like it was the only place for men to be in the 1940s. The map places sports, fishing, hunting, industrial and military sights at every turn. The psycho-geographic landscape depicted by the map make it an invaluable record of a bygone era: sharks, 'steamships to and from Cuba,' 'the largest sponge market in the world,' circus winter quarters, lawn bowling, major league baseball, and annual Seminole sun dances. The map was designed and engraved by Tampa Photo-engraving Co. Inc. for the State of Florida Department of Agriculture, Nathan Mayo, Commissioner. The cover of this foldable map reminds us to 'Be sure to unfold this Pictorial Map' as 'It will serve as a helpful guide to the Sights to See and Things to Do in Florida,' with compliments of Florida's Dept. of Agriculture. Very good. Two minor repairs done with conservator's tape on verso, see image.